Cunard Line has announced the Verandah Restaurant will be added to Queen Mary 2 during its multi million pound refurbishment in 2016. The new Verandah Restaurant will be added to the cruise lines flagship in a major dry dock that will take place from 27th May to 21st June, 2016. The new dining venue will be opened in June once the upgrades are complete. The Verandah Restaurant will open exactly 80 years after the first Cunard Verandah Grill went to sea on Queen Mary in 1936. The restaurant will replace the current Todd English restaurant that is onboard. A new regional French flavour will be brought to the venue along with seasonal influences. There will be an added surcharge for lunch and dinner which will also included before and after drinks at the bar. 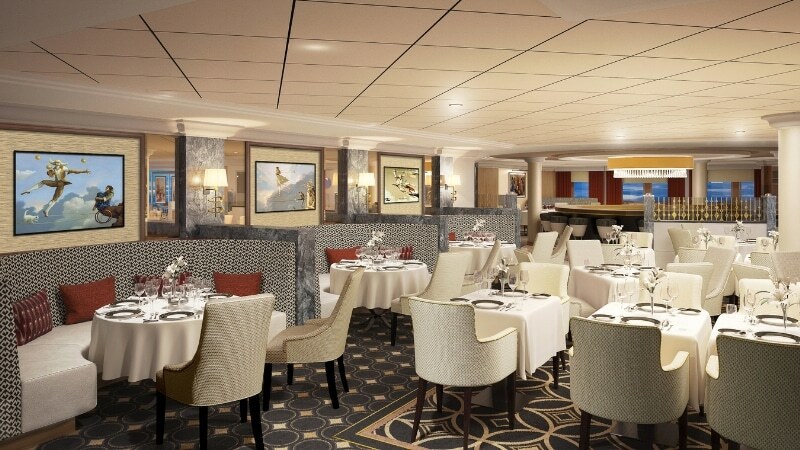 The dining experience will be like no other where guests will feel like they are in the old Verandah Grill Restaurants from the old ocean liners. The Verandah can already be enjoyed on Queen Elizabeth and Queen Victoria. Queen Mary 2 will receive lots of new enhancements and spaces during the refurbishment. At the beginning of December Cunard Line revealed details of the upgraded King’s Court casual buffet. The cruise line is expected to reveal more details about what’s to come over the coming months.